Poor old Bill Gates. 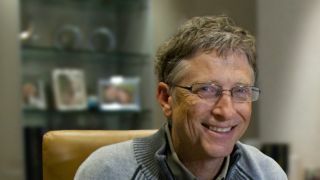 Obviously we mean poor as in unfortunate, rather than skint, but you've got to feel sorry for the Microsoft chairman and billionaire philanthropist: three of Microsoft's key investors reckon that Microsoft would be better off without him. We're not so sure. "You could argue that what Microsoft really needs is more Bill, not less,": Microsoft has made mistakes - such as choosing Ctrl-Alt-Del for logging in - and missed opportunities, but, "Is the problem really a lack of vision at the top, or is it the need to satisfy shareholders who can't see beyond the next set of financial results?" One of Microsoft's biggest customers has traditionally been Dell, whose just-in-time manufacturing put millions of PCs in our homes and offices. These days Dell isn't tied to one OS, however, and while it unveiled some impressive new Windows 8 tablets this week running Windows 8.1, it also showed off some new Android ones too. As Kane Fulton explains, the Windows tablets are aimed at "anyone from consumers to small and midsized businesses and enterprise users," - that's laser-like targeting right there - and there are two of them: an eight-inch one and an 11-inch one. They're called the Hands on: Venue Pro 8 review and - you're ahead of us here - the Hands on: Venue Pro 11 review, and they're really rather nice. Can Dell's new tablet set Windows 8.1 alight? The Android tablets are pretty nice too. The Venue 7 and Venue 8 run Android 4.2.2 and will come in both Wi-Fi and 4G flavours, and they're priced to sell: as Michelle Fitzsimmons reports, "When the tablets become available October 18, the Venue 7 will retail for $149.99 (about £92, AU$160) while the Venue 8 hits a $179.99 (about £110, AU$192) price mark." What's small, rectangular and makes a pleasant noise? No, not Kylie Minogue in a box: the LG G2, which came agonisingly close to topping our Best Mobile Phones chart. As Marc Flores explains, it has an amazing screen and an excellent camera, but it's let down by "awful button placement." If you don't mind that, it's possibly the best mobile phone around. If you watched the finale of Breaking Bad this week you weren't just benefiting from a whole bunch of technological advances: you were watching the actor we really, really, really want to see playing Half-Life's Gordon Freeman in a film. Check the picture on the linked article and the one on our story about Valve filing a trademark for Half-Life 3 and tell us Heisenberg isn't Freeman. He is! HE IS! We're not saying that Half-Life 3 has been a long time coming, so we'll just point out that Vince Gilligan managed to make 62 episodes of Breaking Bad, widely considered to be the best television series of all time, since the last Half-Life instalment. Hugh Langley reckons that when - if - HL3 ever comes out, it's going to be a crushing disappointment. "Half-Life 3 risks coming down with a nasty case of Godfather Part III syndrome: a whole lot of waiting for one crushing anticlimax. Or, if you will, this could be Valve's Chinese Democracy." How's your battery? If you're on a smartphone, the answer is probably, "Not as good as I'd like". Find out what the problem could be, and read the solutions to solve it, too, courtesy of engineers from the world's top phone firms. Here's a hint: get away from that radiator!